Be Rational. Be Outspoken. Be Heard. Kevin Davis is the Founder and Editor of SecularVoices.org, and the author of Understanding an Atheist: A Practical Guide to Relating to Nonbelievers, a book aimed at improving relationships between the religious and their atheist loved ones. He’s most recently known for being co-founder and Executive Director for Young Skeptics, an elementary-level after-school program for kids focused on developing critical thinking skills. Young Skeptics was launched in January 2015 as an alternative to the controversial Good News Club, an organization operating in public schools that evangelizes children and spreads fundamentalist Christian doctrine focused on shaming children for their sins. His writing has been featured or mentioned on CNN, Huffington Post, Salon, RichardDawkins.net, Patheos, and many others. You can find Kevin on Twitter (@SecularVoices) and Facebook. Can't Make It to the Ark Encounter Protest? Follow SecularVoices LIVE! CONTEST!! Picket Sign Writer's Block... I Need Your Help! SecularVoices is on FtB! Obviously. I’m currently on an airplane flying out of Cincinnati/Kentucky that contains roughly 50 people, one of which is a popular atheist blogger over at Patheos. By my count, that’s one too many atheist bloggers on a flight this small. So a safe landing would prove that God does not exist, since for a brief moment, he had us right where he wanted us. And if the big man does take us down, I would like to go down in history as the person who proved the existence of a deity. All kidding aside, yesterday’s protest at the Ark Encounter was a smashing success. 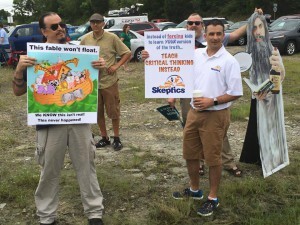 About 100 demonstrators joined the Tri-State Freethinkers in their effort to raise awareness of the several unethical, if not illegal, practices of Answers in Genesis, Ken Ham, and his irrational display of complete scientific ignorance being sold to adults and children lacking critical thinking skills at 40 bucks a head. 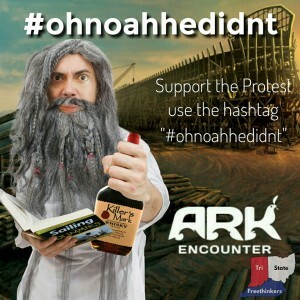 Can’t Make It to the Ark Encounter Protest? Follow SecularVoices LIVE! Tomorrow I’ll be taking part in the Ark Encounter protest and rally with the Tri-State Freethinkers, as well as Dave Silverman, Dan Barker, Aron Ra, David Smalley, Dan Arel and many others. If you are in the area, please join us! The details can be found on the event Facebook pages for the protest and afterparty rally. But if you’re not able to attend, I’ll be live tweeting the event on @SecularVoices, as well as posting on our Facebook page (and possibly broadcasting video there). The event is expected to draw national media and over one hundred demonstrators! The protest organizers are asking everyone to tweet using #ohnoahhedidnt during the event. Let’s get it trending and make some noise on the twittersphere. CONTEST!! Picket Sign Writer’s Block… I Need Your Help! As many of you are aware, I’m scheduled to attend the Ark Encounter protest on Thursday, July 7th, as well as speak at the after party & rally. I’m working on having a picket sign printed with the Young Skeptics logo, but I’m having a total block when it comes to something catchy to include. Feel free to make some suggestions in the comments here and I’ll pick one or two to add to the sign! Once it’s printed, I’ll post a picture of it and you may even see your work on the news! Here’s what I have so far, but I’m not sold on any of them. What suggestions do you have? The sign will have the Young Skeptics logo as well as “Teach Critical Thinking Instead”. So the other text will have to mesh with that message. And I’d prefer it be something not entirely specific to the Ark Encounter or AiG so I can use it again at future events. Contest ends today (Friday 7/1) Ok, go!